(1) DART Police Headquarters gave new life to the old Monroe Shops building. (2) Motion detectors control the lights in the Northwest Rail Operating Facility. (3) The GoPass mobile app and GoPass Tap fare payment card reduce paper ticket waste. (4) New LED bulbs make West End Station brighter while using less energy. Public transportation is eco-friendly by nature. Buses, trains, streetcars and vanpools take single-occupancy vehicles off our congested roadways. Fewer vehicles and faster commutes lower the emissions of greenhouse gases and other pollution. 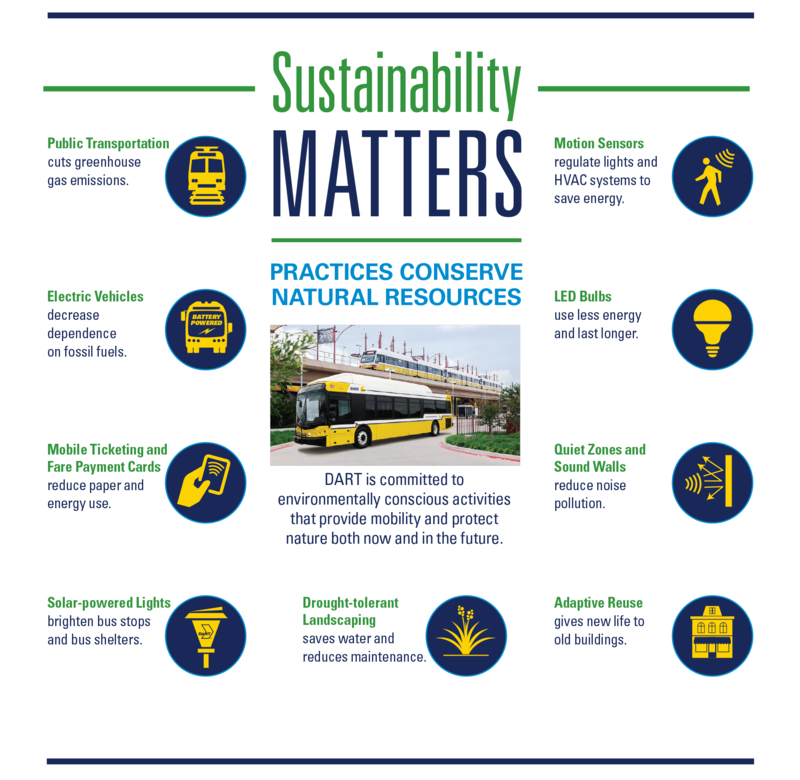 While improving mobility is DART's greenest contribution to the environment, the agency is committed to sustainable practices in many areas of its operations. In July, DART began operating its new fleet of all-electric buses on the D-Link route (see more here.) These battery-electric buses produce zero tailpipe emissions, require no oil changes and reduce the agency's dependence on fossil fuels. The electric buses join the DART Light Rail trains and Dallas Streetcar vehicles as zero-emission members of the agency's transit fleet. DART's GoPass® app and GoPass® Tap cards provide mobile ticketing options that reduce the need to print and distribute paper tickets and passes. Customers gain convenience while the agency reduces material and energy use. Approximately 70 percent of DART's passenger shelters have solar-powered lights. There are also 100 freestanding solar-powered LED bus stop lights throughout the system to improve security for riders and make it easier for bus operators to see waiting passengers. At the Northwest Rail Operating Facility, motion detectors trigger the lights only when the area is in use. When unoccupied, spaces like hallways, conference rooms and bathrooms are dim or dark to save electricity. The HVAC system recognizes whether the room is occupied or empty and adjusts itself accordingly. The agency's Maintenance Department has gone green as well, using only the lowest-impact chemicals for cleaning parts and other tasks. The agency recycles up to 22,000 gallons of antifreeze per year, and recycles all plastic jugs, aluminum cans and paper. DART Police Headquarters, located in the historic Monroe Shops building, was honored by the United States Green Building Council as the first publicly owned building listed on the National Register of Historic Places to achieve the LEED® Platinum Certification, the organization's highest recognition. The building features Energy Star®-rated systems, daylight-responsive controls, and water-efficient faucets, shower heads and toilets to reduce power and water consumption. 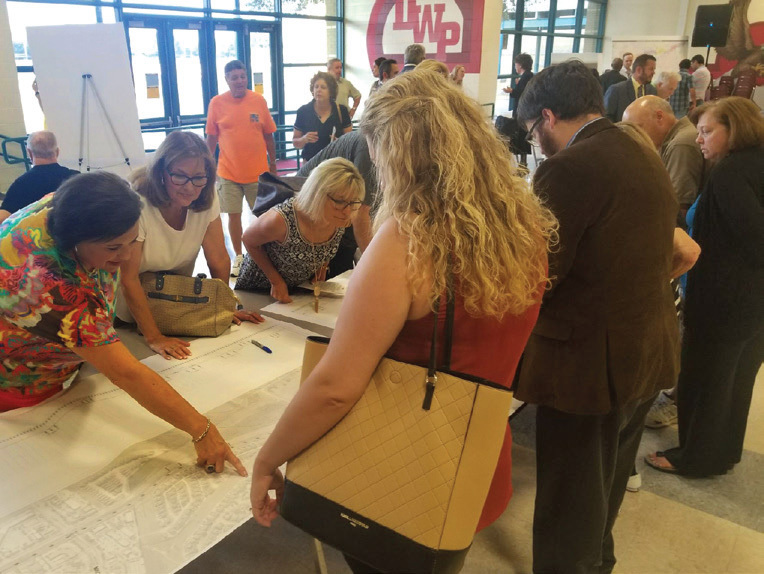 The agency held a series of community meetings to gather public input on potential environmental impacts of the Cotton Belt Corridor Regional Rail Project. For most capital projects, the agency conducts an environmental assessment, which is documented in a report such as an Environmental Impact Statement (EIS). These reports identify both a project's potential impacts and ways to reduce or eliminate them through mitigation. The agency looks at a broad range of environmental categories including, but not limited to: land use, air quality, noise, vibration, visual and aesthetic impacts, ecosystems, hazardous materials, cultural resources and parklands. 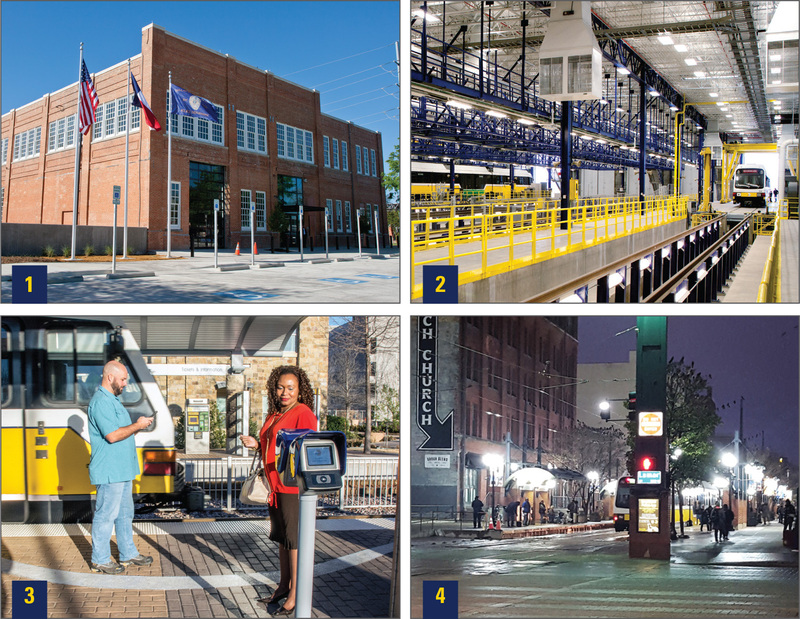 Currently, DART is finalizing the Cotton Belt Corridor's EIS. The agency is reinitiating the Preliminary Engineering/Environmental Impact Statement process for the D2 Subway project to refine the locally preferred alternative and assess how the project will affect and integrate into downtown Dallas.